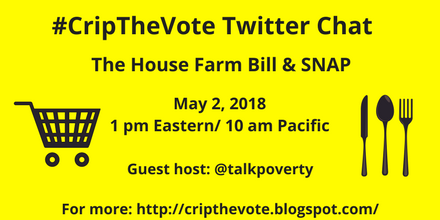 Graphic with yellow background and black text that reads: "#CripTheVote Twitter Chat, The House Farm Bill & SNAP, May 2, 2018, 1 pm Eastern/ 10 am Pacific, Guest host: @TalkPoverty, For more: http://cripthevote.blogspot.com/ On the left is an illustration in black of a shopping cart. On the right is an illustration in black of a knife, spoon and fork. On April 12, 2018 the House Agriculture Committee introduced the Agriculture and Nutrition Act of 2018 (H.R. 2), also known as the Farm Bill. This piece of legislation is estimated to spend about $860 billion over 10 years and proposes new work requirements on millions of low-income people receiving food stamps. Join #CripTheVote and guest host Talk Poverty in a conversation about the Farm Bill, SNAP (Supplemental Nutrition Assistance Program, also known as food stamps), and the impact on low-income people with disabilities. We especially welcome people who currently use food stamps or used it in the past to join us. Follow @GreggBeratan @AndrewPulrang @DisVisibility @talkpoverty. 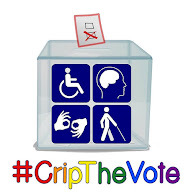 When it’s time, search #CripTheVote on Twitter for the series of live tweets under the ‘Latest’ tab for the full conversation. Welcome to the #CripTheVote chat on the #FarmBill (HR 2) and how it will impact people with disabilities. We are delighted to have guest host @talkpoverty join us. 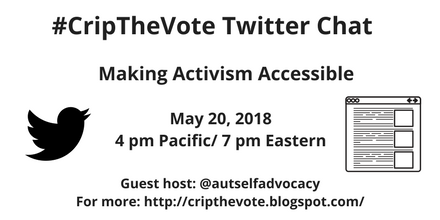 Image description: white graphic with black text that reads "#CripTheVote Twitter Chat: Making Activism Accessible, May 20, 2018, 4 pm Pacific/ 7 pm Eastern, Guest host: @autselfadvocacy, For more: http://cripthevote.blogspot.com/. On the left is the icon for Twitter, a bird in black and on the right is a graphic in black of a website with text. How can activism become more accessible? How are people with cognitive disabilities left out of activism and political participation? Join the co-partners of #CripTheVote in a discussion about these issues with the Autistic Self Advocacy Network (ASAN). From ASAN: People with cognitive disabilities think and learn differently. Down syndrome and autism are examples of cognitive disabilities. We might need more support to learn something new. Using simple, common words to explain things helps us understand. The Autistic Self Advocacy Network is a nonprofit by and for autistic people that works to educate communities, support self-advocacy in all its forms, and improve public perceptions of autism. Welcome to the #CripTheVote chat on making activism accessible! We are delighted to have guest host @autselfadvocacy join us. Please note: accessibility is a broad topic and today’s chat will focus on accessibility for people w/ cognitive disabilities. Follow @GreggBeratan @AndrewPulrang @DisVisibility @autselfadvocacy. When it’s time, search #CripTheVote on Twitter for the series of live tweets under the ‘Latest’ tab for the full conversation. If you don’t use Twitter, you can follow along in real time here: http://twubs.com/CripTheVote If you might be overwhelmed by the amount of tweets and only want to see the chat’s questions so you can respond to them, check @DisVisibility’s account. Q5 On information and language: How can materials (printed, online, video, audio, social media) become more accessible for people w/ cognitive disabilities? What are some great examples you’ve seen? Resources? Q8 For people with disabilities who have other marginalized identities: how do we make sure everyone gets a ‘seat at the table’ when it comes to community organizing and activism? Note: We are boosting the following announcement from the National Disability Leadership Alliance, which may be of interest to people with disabilities who want to take the next big step in their quests to #CripTheVote ... by running for office. Although one in six voters has a disability, we are underrepresented and under-recognized as political candidates and public servants. This call will talk about the importance of running for and serving in public office as a person with a disability, the challenges and opportunities that people with disabilities (especially those who are multiply marginalized) face in campaigns, and the work being done to increase resources to train disabled leaders to run for office. Congressman James Langevin (tentative) represents Rhode Island's 2nd Congressional District. Thida Cornes was the first openly disabled candidate to run for Mountain View, California City Council and serves on the Mountain View Environmental Sustainability Task Force. Reyma McDeid is currently running for Iowa House District 38 and is the Executive Director of Central Iowa Center for Independent Living. Sarah Blahovec is the Disability Vote Organizer for the National Council on Independent Living. CART: The call will have real-time captioning (CART)! The website where you will be able to view the captioning is https://2020archive.1capapp.com/event/forum/. Thank you to the National Disability Leadership Alliance for sponsoring the captioning of this call. In the first few months of #CripTheVote, back during the 2016 primaries, we posted a disability issues survey, hoping to get an idea of what kinds of issues and policy ideas disabled voters were thinking about. The results helped guide #CripTheVote discussions, and also provided some concrete ideas to share with candidates, to help engage them more with disability concerns. Two years later, we decided to run the same survey again, with the same purpose, but also to see how opinions and priorities might have changed. We ran the same questions and options, but also added a place where people could suggest new issues not included in the original survey, that might have emerged since 2016. In this chat, we will discuss these results, what they might mean, and how we can use them during this Midterm Election year. Follow @GreggBeratan @AndrewPulrang and @DisVisibility. 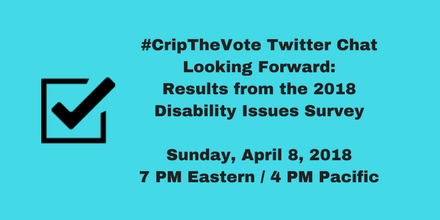 When it’s time, search #CripTheVote on Twitter for the series of live tweets under the ‘Latest’ tab for the full conversation. If you feel overwhelmed by the volume of tweets and only want to see the chat’s questions so you can respond to them, check @AndrewPulrang’s account.